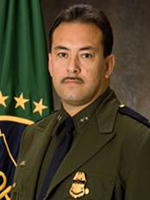 Salvador Nieto is a retired Chief Patrol Agent, having served as a member of the Senior Executive Service from September 2007 until he retired on December 31, 2013. Most recently, Mr. Nieto served as the Department of Homeland Security’s (DHS) Director of the Border Enforcement Coordination Cell at the El Paso Intelligence Center (EPIC). In this capacity, he directed a multi-jurisdictional information coordination cell which served as the primary location for DHS-focused southwest border interdiction, investigative, and intelligence coordination. These efforts enhanced information sharing and collaboration between DHS, the Department of Justice (DOJ), the Department of Defense (DOD), state, local and tribal law enforcement, as well as international and non-governmental partners. Prior to this, Chief Nieto served as the Chief of Northern and Coastal Border Operations for the U.S. Border Patrol headquarters in Washington, DC. In this role he increased staffing by 110% to effectively bring border security to a manageable level across approximately 6,000 miles of northern U.S. land border and coastline. ​Previous to his assignments in Washington D.C, Chief Nieto served in different leadership and managerial capacities in the El Paso and Del Rio, Texas Sectors. Chief Nieto attended Florida State University and is a graduate of the Columbia University School of Business. Chief Nieto was raised in the El Paso, Texas area and served six years in the active Air Force and four years in the Air Force Reserve.